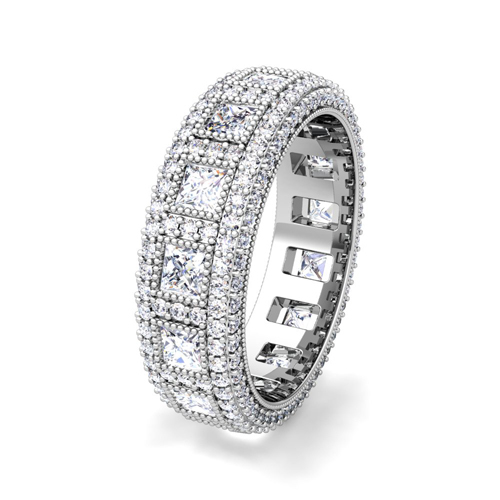 Custom fancy wedding ring in eternity wedding band setting with your choice of diamonds or natural gemstones in 14k or 18k white, yellow or rose gold and platinum. 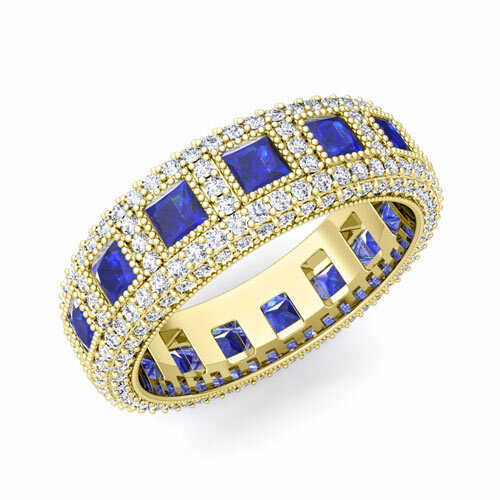 This stunning 14k gold eternity ring is encircled with princess cut blue sapphires surrounded by pave diamonds which encrust the band to dazzling effect. 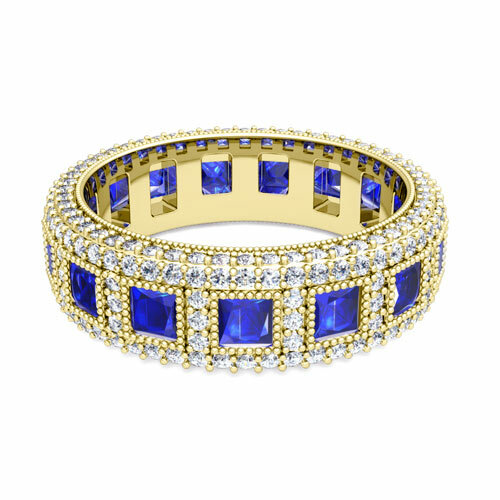 This stunning 18k gold eternity ring is encircled with princess cut blue sapphires surrounded by pave diamonds which encrust the band to dazzling effect. This stunning platinum eternity ring is encircled with princess cut blue sapphires surrounded by pave diamonds which encrust the band to dazzling effect. This stunning 14k gold eternity ring is encircled with princess cut pink sapphires surrounded by pave diamonds which encrust the band to dazzling effect. This stunning 18k gold eternity ring is encircled with princess cut pink sapphires surrounded by pave diamonds which encrust the band to dazzling effect. 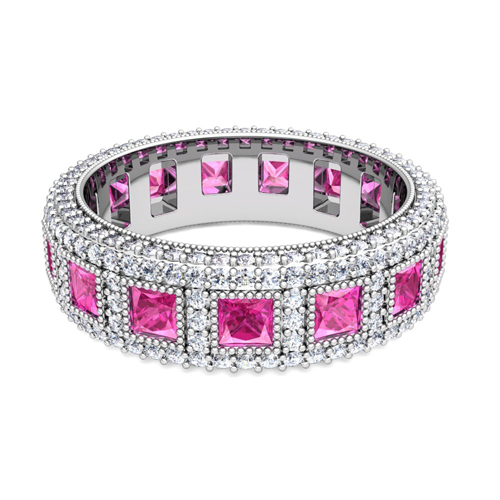 This stunning platinum eternity ring is encircled with princess cut pink sapphires surrounded by pave diamonds which encrust the band to dazzling effect. This stunning 14k gold eternity ring is encircled with princess cut yellow sapphires surrounded by pave diamonds which encrust the band to dazzling effect. This stunning 18k gold eternity ring is encircled with princess cut yellow sapphires surrounded by pave diamonds which encrust the band to dazzling effect. This stunning platinum eternity ring is encircled with princess cut yellow sapphires surrounded by pave diamonds which encrust the band to dazzling effect. This stunning 14k gold eternity ring is encircled with princess cut rubies surrounded by pave diamonds which encrust the band to dazzling effect. 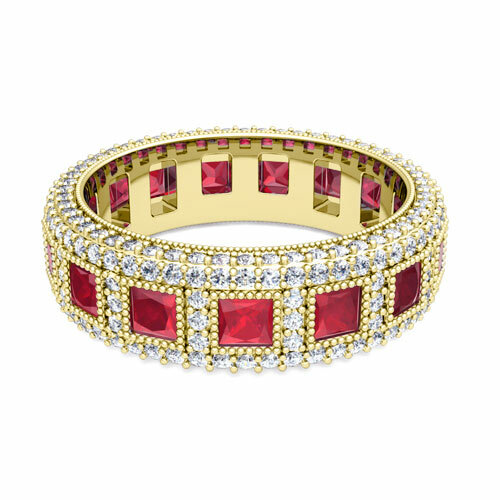 This stunning 18k gold eternity ring is encircled with princess cut rubies surrounded by pave diamonds which encrust the band to dazzling effect. This stunning platinum eternity ring is encircled with princess cut rubies surrounded by pave diamonds which encrust the band to dazzling effect. This stunning 14k gold eternity ring is encircled with princess cut emeralds surrounded by pave diamonds which encrust the band to dazzling effect. This stunning 18k gold eternity ring is encircled with princess cut emeralds surrounded by pave diamonds which encrust the band to dazzling effect. This stunning platinum eternity ring is encircled with princess cut emeralds surrounded by pave diamonds which encrust the band to dazzling effect. This stunning 14k gold eternity ring is encircled with princess cut white diamonds surrounded by pave diamonds which encrust the band to dazzling effect. This stunning 18k gold eternity ring is encircled with princess cut white diamonds surrounded by pave diamonds which encrust the band to dazzling effect. This stunning platinum eternity ring is encircled with princess cut white diamonds surrounded by pave diamonds which encrust the band to dazzling effect. This stunning 14k gold eternity ring is encircled with princess cut black diamonds surrounded by pave diamonds which encrust the band to dazzling effect. 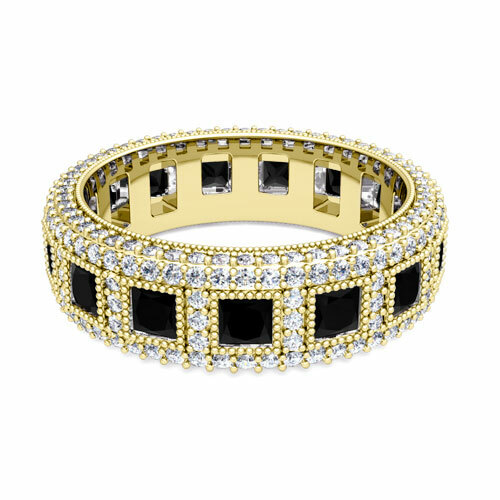 This stunning 18k gold eternity ring is encircled with princess cut black diamonds surrounded by pave diamonds which encrust the band to dazzling effect. This stunning platinum eternity ring is encircled with princess cut black diamonds surrounded by pave diamonds which encrust the band to dazzling effect.